By Tammy: As an esthetician, I’m always excited when I get my hands on a cutting-edge new skincare tool. It’s one of the reasons why I love to work at Azul. Here, we are constantly searching out the latest in skincare technology, trying to find the best new products and treatments to give you a fantastic anti-aging experience. Not only that, we have two secret weapons in our fight against aging in Trilogy Laboratories and Dr. Kristen Flaharty. Dr. Kristen Flaharty, the wife of our own Dr. Patrick Flaharty, is the founder of Trilogy Laboratories, one of the most advanced and innovative cosmetic skincare companies today. With her background in prescription drug development, Dr. Kristen has developed many of the incredible skincare products that we offer through Azul. Every single product that Trilogy Laboratories creates has to get Dr. Patrick’s personal seal of approval. After a lengthy development period at Trilogy Laboratories, we’re incredibly excited to be introducing a series of brand new products for our patients looking for the best in excellent skincare: The Azul Body Line! These three innovative products and their anti-aging properties will help keep your body’s skin youthful and radiant for years to come! As we age, our skin changes. We begin to lose collagen, which can result in wrinkles and loss of skin elasticity. The skin can also get darker, as sun damage can cause DNA damage and hyperpigmentation. If you want a home treatment to help improve the tone and texture of your skin, you want our Advanced Tone and Texture Correcting Body Lotion. Perfect for any skin type, it works immediately to soften and resurface rough skin, and correct tone. Utilizing alpha hydroxy acids, this is for anyone whose skin is environmentally damaged or requires a lightening of pigment. 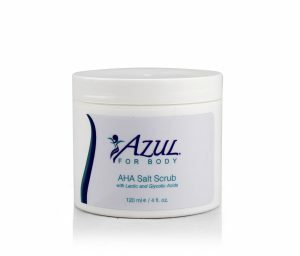 To keep thick, dry-skinned areas of your body soft and youthful, such as the feet or elbows, you can use the AHA Salt Scrub. This intense body scrub utilizes lactic and glycolic acids, along with Dead Sea salts that are high in mineral content, to help soften the skin. Jojoba, squalane and sunflower oils moisturize, while Vitamin E provides antioxidant properties. The next time you are in the shower, all you need to do is swirl the AHA Salt Scrub with your fingertips to blend the salt and oils, apply it to your wet skin (paying special attention to thick, tough, dry areas), and leave it there for up to 10 minutes. Rinse your skin clean with a cloth and follow that up with a body oil or lotion. The AHA Salt Scrub is such a revelation in skincare that you might even find yourself exclaiming “a-ha!” when you see the results. Believe it or not, one of the parts of the body that ages the quickest are the hands. Due to sun exposure, constant repetitive movements, the drying processes of soaps and chemicals, and thin and delicate skin, your hands can age faster than you’d believe possible. Thankfully, we have come up with an exfoliating botanical-based scrub that removes dead skin cells from the surface and helps stimulate cell turnover, revealing younger-looking hands! Our Corrective Daily Hand Cream works best when used after the Microderm Hand Renewal. Formulated with kojic acid and Brightenyl, it fights the production of melanin, which is what creates brown age spots. With a variety of other advanced ingredients, it also increases collagen production in the hands and provides antioxidant properties to protect and repair DNA damage caused by the sun. Perfect for any skin type, it only needs to be applied once or twice daily as a corrective treatment. 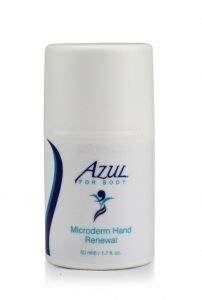 This product is also a perfect companion to our Azul Advanced Sunscreens, helping to protect your hands from further sun damage.